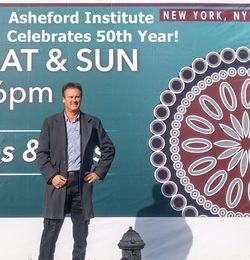 Press Reviews & Articles About The Asheford Institute. Here at the Institute we're always trying to keep abreast of what's being published about the school. Our goal is to bring you the stories and articles unabridged - just the way they were originally written and presented - with no fillers or padding added. . The staff here are constantly scouring the Internet and pages of trade magazines and newspapers from around the world, looking for stories and articles that showcase the Institute, its students, and general accomplishments within the world of the decorative arts. Below, you'll find a small sampling of what we've found over the past fifty years. Luxor, Egypt - It’s not every day that two of Egypt’s favorite topics get discussed in detail by experts from opposite ends of the globe. But that’s exactly what happened this past week when Charles Green, director of the international school Asheford Institute of Antiques, visited the Nile’s Valley of the Kings for an archeological dig, and round-table discussion of some hot-button topics related to "antiques" and "antiquities," with friend and famed Egyptologist, Waleed Ghonnem. Adham: Both you and Waleed appear to have similar positions on Egypt’s antiquities stance, but I'm curious as to how this initial friendship first came about? Adham: Waleed is a big proponent of this country’s 1950’s doctrine that stopped the flood of antiquities out of Egypt, but you’re actually in favor of “newer” items being released, correct? ​Green: What I’ve said in the past is that since Egypt has such a long and storied history, that items or “antiques” from it’s colonial period should be allowed out of the country. To most Egyptians these items don’t even count as old, and hold little to no value currently at home. Therefore, it’s better that the international market for these antiques remains open (as it is now), so that they can be preserved in other countries. history all over again, wouldn't you agree? Green: No, not at all. Today, you can go to America, and find almost as many English antiques in that country as you can in England. To this day, you can still export English antiques by the container load to any country around the globe. It’s this worldwide desire for these pieces that keeps them alive and preserved - literally. Without that export interest, many great pieces from different countries would have likely just withered away on the scrap heap of their own borders. Sometimes it takes someone on the outside to recognize that value first. Adham: So, you see the preservation of Egyptian antiques as something external? Green: It’s not just external. If Egyptians see an international demand for items they themselves currently place little value on, it’s only going to be a matter of time before the tide turns, and they’ll realize that what they have is inherently valuable. Which in the end, will help them to preserve their own decorative arts. By this measure, it then becomes an act of internal preservation. Adham: Some are claiming that publicly viewable "digs," such as the one you and Waleed will be attending, could actually hurt the protective efforts of our antiquities department by showcasing the fact there are still plenty of ancient treasures yet to be unearthed. Do you see this as a valid concern? Green: Actually, I think the opposite is likely to be true. The more you shine a light on things, the less likely nefarious enterprises are going to be interested. Most top antique dealers and appraisers are aware that such items do not belong outside of Egypt, and would likely report such physical cultural expropriation should it occur. In my mind, the more you can get the word out to those in related sectors, such as the antiques and decorative arts communities, the better. Adham: Are you and Waleed expecting to unearth any treasures this week? If readers would like to learn more about the international antique and decorative arts school run by Mr. Green, they can be reached via email at: asheford@mail.com, or through the school's web site at: www.asheford.com. The school has registered offices in the United States, Canada and England. Toronto - The interest in the ancient Socratic Q&A format for acquiring information and data is apparently not dead after all. 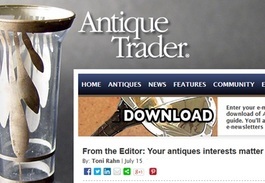 With the proliferation of keyword look-ups, and instant online answers, this classic construct for gaining knowledge may seem like a bit of an anathema these days, but not so according to managing editor, Toni Rahn, from Antique Trader Publications. ​"We've seen some really strong interest by our readership in the Question & Answer column of the paper," she said. "In fact, response has been so good that we've asked the Asheford Institute to supply us with additional appraisers and evaluators to help meet the demand." 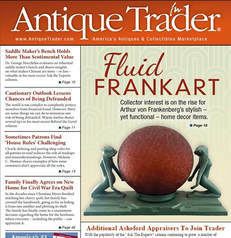 ​Antique Trader originally started the question and answer series column in their bi-monthly newspaper over five years ago, when they asked readers to send in photos of their antiques and vintage items for research and evaluation purposes, with Asheford agreeing to supply the paper with professionally certified appraisers as evaluators and researchers. ​Since that time, according to Rahn, the response has been literally overwhelming from the get-go, with a flood of requests coming through the post and the Internet on a daily basis. ​For their part, Asheford noted that all the original appraisers that were supplied to Antique Trader at the inception of the program, are still there today answering questions and helping readers to identify and evaluate their historical items and heirlooms. ​When asked about the recent request to increase the number of appraisers going to Trader, Charles Green, Director of the Institute was quoted as saying that he thought it would be a win-win situation for all involved. "Our top appraisers get to showcase their skills on a national level," said Green. "And for Trader, they get to see just how great our graduates really are..."
​For the appraisers themselves, it seems like giving a little on the side has had its benefits as well, with some appraisers claiming that they've not only been offered great professional opportunities as a result of the national exposure, but that they've also been able to dedicate more time to truly honing their craft through the very act of participating in the paper's Q&A sessions. However, should your interests lies more in conducting appraisals than receiving them, then you can find out more information about the Asheford Institute's professional-level appraisal program, and what it takes to become an expert in this field, by visiting their appraisal page at: Asheford Appraisers. They can also be contacted directly at: 877 444-4508, or you can write to them at; the Asheford Institute of Antiques 981 Harbor Blvd., Suite 3, Dept. 275 Destin, FL 32541-2525. In Canada: 131 Bloor Street West, Suite 200, Dept. 124 Toronto, ON M5S 1R8). Accurately appraising an item's value is just one skill taught as part of the Asheford Institute of Antiques online study course that teaches a comprehensive program on antique collecting, restoration, appraisals and sales. "The process is to learn how to correctly discern what you are looking at," said Charles Green, director. ''You have to know the resources that are out there as well as the comparables." furniture, glassware, military items and metalware, along with antique styles, their care and restoration as well as discerning the real from the fake. The curriculum also covers the nuts and bolts of the antique business, including selling, restoring, importing and appraising. Depending upon the options chosen, the course costs from about $1,000 to $1,400. 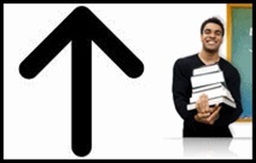 A full course outline is provided on the institute's website at asheford.com. ''Almost 80 to 90 percent of our students come with preconceived ideas about where they want to go with their education," Charles said. ''And, we get a certain percentage of people who have been in the business for years and want to move into appraisals." Once you learn the basics, then you can advance more. It definitely improved my business because I now know what my quality items are worth. Any time you gain knowledge about what you are doing, your business will gain from it. The other day I found a pocket watch at a local flea market and just by looking at it, I knew what it was. I remembered what I had read and knew enough to take it home and research it. I bought it for $20 and it was a $400 watch." While some may believe they can get all the information they need from independent research, Justin noted that having a solid background in antiques, vintage items, and collectibles has proved a better place to start. "I could have spent hours on the internet and never have known what that watch was." David Moore's antique education began early. "I have been into antiques since I was five-years old. My grandfather and uncle both had antique businesses," he said. By the time he was six years old, he was buying antique clocks and by age ten, he was repairing them. decades, extending its offerings to students in Canada, Europe and Asia. "In the old days, it was called 'home study' but now it's distance learning," he said, adding that the program is transitioning from textbooks to a computer-based online study program, which ''has allowed us to make major updates quickly." That's important because antique and collectible styles, and consequently their values, tend to fall in and out of favor over time. "It's really very cyclical in the antique business," he explained. "But, the high-end pieces never really lose their full value. There are always new folks who come along and want these." Working at their own pace, most students complete the course within a year, although the institute allows them up to four years to finish. The staff fluctuates between 40 to 80 instructors and appraisers, depending upon the number of students enrolled at a particular time. ''When we enroll students, they are assigned to an instructor who helps them work through the process," Charles said. As students progress, they complete a series of seven exams comprised of multiple choice and essay questions. "If they have a problem, then we'll work with them in that particular area." said. "They're just giving a value based on what they would pay for the item." David was bothered by such practices, "which is why I searched out a legitimate organization to help me become a professional appraiser with a code of ethics I could follow." appraisers to confirm values. ''We have auction houses from overseas that have employees who they want certified so that they can appraise," he said. ''And, we have those who want to become estate liquidators." That was the case for graduate Justin Pennington of Poplar Bluff, Missouri. "The course got me into the auction and estate liquidation line of it," Justin said. The 28-year-old's business, JP's Bargain Barn and Estate Liquidations, also includes antique, vintage and collectible sales. "I was interested in learning more about furniture - the different styles and time frames. But, not just furniture... glassware and silver as well, and to learn how to identify pieces." His own expertise is in Civil War materials, but through the Asheford course, he broadened his knowledge into areas such as furniture and glassware that quickly became useful when he was asked to assess an estate. ''They had a William and Mary chest-on-chest," he recalled. "I couldn't have identified that before I took the course." Even as a long-time collector, he understands that he can never know enough about the business. "There is a portion of the course dedicated to how to set up a shop and how to conduct estate sales," he said. "I had already been doing that for a number of years, but what the course taught gave me comfort that I was doing the right thing." Currently, David has an online antique business, "Waterman Antiques," and writes for antique and collectible publications. He also sells through antique malls, provides appraisals and helps museums and clients who are looking for specific items. "I work with a lot of professional people who know the real thing from a fake," he said. "I have to be on my game to satisfy their needs." Charles estimates that since 1966 more than 110,000 students have taken the course. Missouri dealer Justin Pennington recommends it for everyone interested in antiques, vintage, and collectibles - from beginners to seasoned dealers. "It's a lot more than just a piece of paper hanging on the wall, he said about the certification from the Institute. "I now have the confidence to tell customers about pieces, and they know that I am legitimate." Florida - The latest results from the Asheford Institute (a professional-level distance learning program on antiques, collectibles and appraising), recently published it's annual survey of top buying trends within the antiques and collectibles community this past week. The Institute, which has been conducting the industry related survey for over six years now, released its latest trending data on decorative arts sales for 2017 via a dedicated page on the school's web site. The survey, which focuses on compiling and grouping information related to customers buying habits over a twelve month period, came about as a result of strong interest from readers requesting updates from previous surveys, said current Director of the Institute, Charles Green. He went on to note that there were some interesting changes in the poll results this year. "Our questionnaire has become more detailed, resulting in answers that are more period and genre specific. We're really able to drill down now into the types of antiques and vintage items that are actually selling well within a 12 month period." Green also acknowledged that the increase in poll-participants (up 15% over last year), had led to more accurate survey numbers in regard to particular sales categories. "More data has simply given us better survey results," said Green. The school's lead Poll Researcher, Tony Frey, echoed Mr. Green's sentiments and went on to say that the main goal of the Institute's survey was to provide meaningful analysis of measurable interest in current trends within the antiques and collectibles marketplace, based on actual sales results and requests for specific items from vendors. questions, and did not employ any standardized formulas, the overall results were still very revealing when looked at as a whole. “The shift in what's considered collectible is continuing to change, and at a more accelerated pace than ever before," said Frey. "For the last few years it's been Mid-century modern, but this year we're beginning to see some cracks in that crown." According to Frey, there was a perceptible change in attitudes by some buyers towards the Mid-century genre. In a special section of the poll reserved solely for comments, many store owners were reporting "Mid-century-fatigue," by both buyers and collectors. "It would seem that this area of interest may be peaking," said Frey, "but we probably won't know for certain until next year." As one dealer who completed the survey said, "It's not a return to the golden years of the 1980's, but there's definitely more interest in brown furniture again - especially the primitive stuff." Some of the other highlights from the poll included a resurgence of all things Western. "We're seeing a revitalized interest by the public in literally anything related to the American past and particularly the wild, wild west" said Frey. Other top sellers on the school's list included a few industry standards such as Star Wars items, space related toys from the 1960's and 70's, as well as automobilia and related mechanical items. Frey noted that just as in past polls, the most visible movement in collecting genres was being reported by younger dealers, who indicated that consumer tastes seemed to be trending towards virtually anything related to the latter half of the twentieth-century. "The reality is the younger collectors are the one's moving the ball forward now," said Frey, "the rest of us just appear to be along for the ride." For readers wanting to view the full results of the Institute's survey, you can find them online at: http://www.asheford.com/2017-survey-results.html. For more information about the school's antiques and appraisal course, they can be contacted at: (877) 444-4508, or you can write to them at; the Asheford Institute of Antiques 981 Harbor Blvd., Suite 3, Dept. 275 Destin, FL 32541-2525. In Canada: 131 Bloor Street West, Suite 200, Dept. 124 Toronto, ON M5S 1R8). 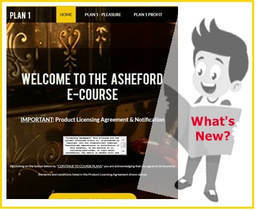 It's been just over three years now since the release of the Institute's new online format, and yet this instantly recognizable home-study program from the folks at Asheford continues to impress with a host of recently updated features that keeps this Courseware tops in its class. When the new online beta-version from the Institute was first released to a few media outlets back in 2014, we were lucky enough to get our hands on some gifted access-codes for a full test-run of the school's introductory launch of its newly released format. It was Asheford's first foray into the world of online teaching since the inception of the school and their textbook version in 1966. Since that initial roll-out, we've had a chance to put the new e-Course through its paces over the last two years - from top-to-bottom - and it certainly hasn't disappointed. In fact, we've been hard-pressed to find fault with this program, period. When we first started digging into the school's new online offering, one of the things we noticed immediately was how simple and easy it was to use - this hasn't changed one bit since its inception. In fact, it's gotten even better, as the screen's left-handed content-menu is now on every page, making clicking between subjects and previous pages a breeze. The web-layout is a standard 3-column stance, which is the ideal format for online viewing - allowing for different but related content to be seen simultaneously, so that various instructional ideas and themes can be connected at the same time. One of the other things that we really liked about the Asheford program's design composition, was how intuitively they embedded related subject videos into topic headings - they were right where they needed to be, and didn't overwhelm the text or other content on the page - it was a seamless integration into the overall layout of the site's structure. Since that time, school developers have continued to add new Course related videos to content pages while also managing to streamline and refine the overall viewing process in terms of quality and material content. never once had a problem with down-time or accessing the study plans. The site was always up, and our entry-codes always worked. On top of that, no Course downloads were required since everything was in the clouds and online. This made accessing our study modules and completing Course assignments frustration-free (making Asheford somewhat of a pleasant anomaly in today's wired world of online classes). One question that we did initially have though when first reviewing the e-Course, was related to material updates. It was clear from the get-go that the curriculum was going to be intense and comprehensive in scope, but what about changing market conditions, or buying trends - how would issues such as these be addressed, or would they? However, to my own surprise (and that of a few other industry insiders who were also reviewing Asheford at the time), the updates began almost immediately - and continued to appear in the study modules on a regular basis. Which, according to Shelly Duval, one the school's e-Course spokespeople, is the whole point of having the program online, "Updates are absorbed directly into Course pages, or are added as Supplemental Information listings at the end of each Course subheading, so that students can easily access any information regarding relevant changes within the industry." This thoughtful and practical approach from the Asheford design team gives students the updates they require in a timely and beneficial manner, by allowing the school's staff to sift through data and decide on what's truly relevant (or not), before posting into the Course's study modules. In short, it gives students the right info they need, when they need it. This attention to instructional detail is what helps elevate Asheford's educational platform to a higher level than virtually any other online Courseware program. Real-time improvements and updates coupled with ease-of-use, also make the e-Course stand out from the crowd in terms of information accessibility, as well as vetted Course content. Three-years on, and the Asheford Program has not only become easier and more intuitive to use, but the actual content and layout has been tweaked for even greater performance from a product that was already outstanding to begin with. Which means that if you're truly considering a lifestyle or vocation change, involving professional-level training in the decorative arts field, then this is probably one Course that will actually get you where you need to go. For readers seeking more information about the school's new e-Course click here: Asheford "e-Course." Or you can contact the Registrar's Office at: (877) 444-4508, or visit their web site at: www.asheford.com. News-Antique.com - While not quite considered an “antique” just yet, the Asheford Institute of Antiques, a professional-level distance learning program on antiques, collectibles, and appraising, turned fifty this past week, marking a milestone in antiques and appraising education, as the longest running Institute of its kind. Although the school premiered its home-study program to the antique world in late 1965, it didn’t officially open its doors to students until 1966.
high-water mark over the past fifty-years, Green unabashedly responded that the introduction of the school’s new online e-Course earlier this year was a game-changer for antique and appraisal education in general. ”The e-Course allowed us to bring a half-century worth of teaching expertise to a new and expanded format,” said Green. “With the ability to use online interactive multimedia for instruction, we’ve really been able to raise the bar in antiques and appraising education for our students.” Green went on to say that although online instruction had obviously become the new norm, the “textbook” version would still be offered for a number of years to come. According to a press statement, as part of the school's year-long celebration, staff from the Institute will also participate in a traveling roadshow to commemorate the school's 50th anniversary. Plans reportedly include tours of major antique events and shows throughout North America, and will incorporate free appraisal clinics, business seminars and evaluations to mark the Institute’s anniversary. “We really want to give something back to our students and those interested in antiques,” said founder Peter Green, “It’s been a great privilege to teach so many… it’s just our way of saying thanks.” Exact dates for upcoming events have yet to be released, but are expected to be announced later this month according to school spokesperson, Pamela Drew. IA - Sometimes the most truthful things sound cliché, even though they are the exact sentiment we want to convey. With that in mind, I want to reiterate something I hope you already know: Your opinions, thoughts, and antiques interests and needs matter to us. This simple truth is at the core of why we do what we do, and why we say we work for you. Some of our favorite Antique Trader features are those where you share your comments and questions. In our July 24 issue you’ll find many examples of this, and I want to draw your attention to a couple. letting your voice be heard, and we encourage everyone to take advantage of this space to comment on something you read in our magazine, question or offer opinions about a topic within the antiques and collectibles community. Whatever antiques-related thoughts you want to share, please do. Another popular place where reader interests and needs are shared is in our Ask the Experts column. This fascinating section features subscriber inquiries into the identification and value of various items, and it also includes the assessment of that inquiry by a graduate student of the Asheford Institute of Antiques - our partner in providing this popular and valuable service. We do have a waiting list for this professional assessment service, but we are pursuing additional options to serve more of your inquiries more quickly. Thank you for being an active part of “your” magazine – keep those letters coming. New York - The Asheford Institute Of Antiques has formed a strategic alliance with Antiques Young Guns USA, and U.S. Antique Shows, to help develop and promote interest in the antiques industry by a younger generation. The Antiques Young Guns group was originally formed in the U.K., and was founded by noted antique experts Gail McLeod of Antiques News & Fairs, George Johnson of Lady Kentmores, and TV presenter and author Mark Hill in 2011 to foster a new, younger audience’s interest in antiques. The goal of the program is to develop, highlight and celebrate younger entrants into the antiques and art industry through special recognition and unique opportunities for exposure to a national audience of antiques enthusiasts. Darby, U.S. Antique Shows general manager. Among the great aspects of this program are its member benefits, including a mentor-ship program, online exposure through the Antiques Young Guns marketplace, several buying and selling events throughout the year, and additional recognition in numerous trade and national publications. 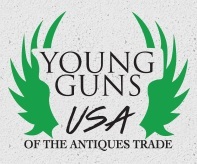 Members will also have the opportunity to be recognized as the "Antiques Young Gun of the Year," at an award ceremony, which will include a prize package with an estimated value of $10,000. This award will be given annually to U.S. or Canadian residents working in the antiques field or an affiliated trade. In order to help promote this endeavor, the Asheford Institute has partnered with these organizations, and will offer three different scholarships (one full and two partial) of their new online e-Course, to the winner and runner-ups of the Young Guns competition at the award ceremony in November. "We're really pleased to be a part of helping young antique enthusiasts grow their talent," said Asheford Director, Charles Green, "After all, it's what we do on a daily basis." So what do you do? There are many ways to learn about antiques. For most people, it's a life-long process including endless reading of books and periodicals, going to museums, auctions, shows, as well as time spent perusing the Internet. Museums offer classes. There are collectors' club and organizations'. Appraisal organizations, historical societies, community education, and universities offer lectures, classes and degree programs. In addition to these vehicles, there is also a unique correspondence school, celebrating its 35th anniversary this year, which, for a nominal fee, offers a comprehensive course for people who want to learn more about antiques for pleasure and profit. Asheford Institute of Antiques, based in Destin, Florida, was founded in 1966 by Peter Green. The author of a number of books, including A History of French, Furniture and Discovering Early American Antiques, Green spent a large part of his youth traveling throughout Great Britain, Europe, and the U.S. with his mother, Diana Green, a collector of some renown from England. Gaining an invaluable sense of the world of antiques at an early age, Green was educated at the prestigious boy's school, Pickering college, near Toronto. He then studied fine arts at Ryerson College and did two years of post-graduate work at the Sorbonne in Paris. After traveling through Europe for the next few years studying various antiquities, Green returned to the United States where he formulated the idea of a complete broad-based course on antiques to help people gain a more practical understanding of antiques in general. He developed the course over a period of four years, introducing it as the Asheford Institute of Antiques in 1966. Florida - A ho-hum economy spurs growth? While at first glance this statement might seem somewhat contradictory given today’s economic uncertainty, it would appear that a few sectors of the antiques market are experiencing some rather significant gains in some rather unexpected areas. The Asheford Institute of Antiques, a professional-level distance-learning program on antiques and collectibles, recently announced that it’s winter enrollment applications had spiked dramatically during the last quarter of the year - a somewhat surprising development when considering the overall state of today’s current marketplace. ARTICLE TITLE: "Jewelry Videos Added To Asheford Program"
ARTICLE TITLE: "Antique-Home-Study Course Helps Beginners Build A Better Library"
ARTICLE TITLE: "The Gems From The Junk - Collectors Look For Age And Quality"
ARTICLE TITLE: Special Feature - "Home-Study Antique Course Expanding To College Curriculum"
ARTICLE TITLE: "Correspondence Course Teaches Antique Savvy"